Honey - a delicacy that is appreciated by all and sundry. 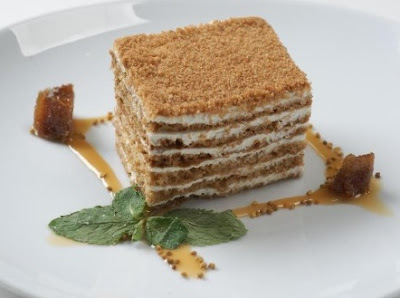 Delicate cake, consisting of a plurality of thin cakes with a pleasant aroma of honey and delicious light cream - this recipe is popular is not the first century, it is still baked in the kitchen of the royal! So heartily suggest you try to cook a wonderful delicate and flavorful dessert - cake honey cake with sour cream. Of course, you have to work hard, honey cake - not the easiest and fastest to prepare the cake. But believe me, the result is worth it. Pay attention to the quality of honey, that you intend to use, because of the too old your honey cake can start to taste bitter. Honey is good with almost any creams, but the most common options - honey cake with custard and cake honey cake with sour cream. But let's proceed directly to the preparation of sponge cake honey cake with sour cream. Soda, slaked with vinegar, and baking powder. To cook a pound of sour cream, fat better, and 1 cup sugar. The Council has yet to take a little gelatin. Own cooking. Preparation for the test is done in a water bath. To do this in a saucepan mix sugar, butter and honey. Bring the mixture to completely dissolve the sugar (preferably with stirring). Remove container from heat and cool slightly. You can now add the eggs. Very neat to drive them with a fork or whisk until smooth. Now is the time flour. The pre-meal add soda. The dough is carefully to prevent and put an hour in a cool place. The cooled dough is divided into nine pieces. Pieces put on the board, floured, and then put into the refrigerator for an hour. And only after that the dough can be rolled out. Since we need a very thin cakes, better roll through the towel. Each of the cakes with a fork to poke a few times. Heat oven and bake cakes (10 minutes at two hundred degrees). Leave to rest, and meanwhile Let us cream. Sour cream should be thoroughly until smooth, beaten with sugar. A small culinary secret - that your cream did not spread, it is necessary add a little gelatin. To taste, add vanilla. Carefully lubricate each cake with a cream consistently laying on each other. One of the cakes can knead into crumbs and sprinkle with crumbs of cake for beauty. If you're tired of the usual honey cake and want something new, you can make a cake honey cake with sour cream and prunes, this combination is also very harmonious and gentle. Oil cream cake is removed in the refrigerator overnight so that it thoroughly soaked. And the next day you can eat a piece of wonderful delicious dessert!